Let’s get straight to it. There’s nothing like a good wet shave. You absolutely love it. But your skin type, facial hair, and coarse beard can’t stand those traditional blades any longer. Traditional blades have been a constant nightmare, and your skin wants justice. Cuts, nicks, and razor burns – they aren’t fun anymore. You are in a dilemma – forget about wet shaving or endure the torture of traditional blades. If only there was a way to enjoy wet shaving with electric shavers… wouldn’t that be a game changer! Sure, it would, but using an electric shaver to meet your wet shaving needs is easier said than done, especially considering the use of shaving cream. So, without further ado, here are our best 10 tips to guarantee a close, painless wet shave with an electric shaver. Have a good pre-shave routine. Often overlooked, having good pre-shave routine will ensure a close, and most comfortable shave. Equally, no prep work, or insufficient prep work will reap undesirable results. So, considering the importance of preparation, it’s important that you get it right. Unlike with traditional shaving where your prep work involves using oil and thick lather, with electric shavers, the main emphasis of your preparation is on getting your face clean. One of the best ways of cleaning your face is by using a cleansing or exfoliating gel with warm water to get rid of any dead skin, dirt, or oil. And just as well, a hot shower isn’t a bad option. Use a quality shaving cream. Among other things, a good quality shaving cream contains ingredients that act on the cuticle (the outer cellular layer of a hair). The cuticle is the hair’s protective shield, and ideally you want your shaving cream to soften the cuticle. When the cuticle is softened, the hair swells and absorb water, which by the way… makes it easier for the shaver to cut through the hair. And at all cost, stay away from aerosol canned shaving cream. Though not considered “harmful,” canned foam, among other hash substances such as parabens and perfumes contain mineral oils known to clog pores and irritate skin. An alkaline substance (Potassium Hydroxide or Sodium Hydroxide). A form of fat (coconut oil, avocado, almond, or olive oil). Glycerin – allows the hair to retail moisture, lubricate the skin, and reduces irritation. Create a thin layer of lather. With both shaving approach (traditional and electric) the lather is important. But traditional lathering and the lather you create to shave with an electric shaver is somewhat different. With traditional shaving, the lather is thick – to cushion the razor’s blade on the skin. But with an electric shaver, the blades are behind a foil and not on the skin, so you don’t need a thick lather to have a cushioning effect on the blades. You need a slick watery lather – just enough water to make the lather thin, slick, slightly pasty and creamy. The quickest and easiest way to get this consistency in your lather is by wetting your hands, add a bit of shaving cream, then rub your hands together (add some water it the lather is too dry). Firmly massage the cream into your skin. To get the best wet shaving results your face must be property wet. To achieve this, wet your face and start massaging the lather (already in both hands) on your face. Massage firmly, as this will prepare the stubble for the shave by lifting them. With the cream on your face, wait (2-5 minutes) until the hair is soften before you shave. 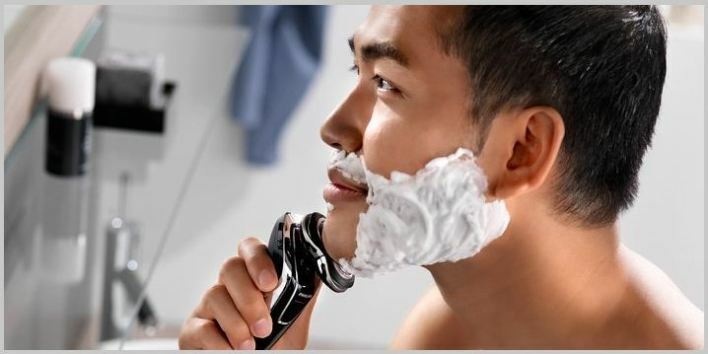 This part is especially important because the alkaline substance in the cream needs time to soften the cuticle – to get the closest shave possible. Shave in the opposite direction of your hair growth (against the grain). It may take a while before you discover the shaving technique that will give you the best results. But generally, it’s good to shave against the grain. Depending on the electric shaver (foil or rotary) you may shave from left to right, or up and down (in a circular motion for rotary and straight for foil). Use an electric shaver that suits you. Most high-end, wet dry electric shavers are of good quality. Braun Series 9 9290cc, Panasonic ES-LV65-S Arc 5, and Braun Series 7 790cc are some of the best foil electric shaver around. But The choice of electric shavers basically boils down to foil or rotary – choose the wrong one at your own peril. If your face has fine features and you don’t grow long hair, then we recommend a foil shaver. But if you have strong facial features and your hair grow think and fast, then we recommend rotary. Your battery should be adequately charged (fully when possible). Often overlooked, but one of the keys for a good shave with an electric shaver is optimum performance. When your electric shaver is adequately charged it will give you the best shave possible. We have found that shavers that aren’t adequately charged tend to pull and tug during shaving. It’s impossible to achieve a close shave when this happens. So, to ensure that smooth, close shave – keep your battery adequately charged. If your skin is extremely sensitive, using a good aftershave balm or lotion will soothe any irritation on your skin. And stay way from alcohol-based aftershaves – they will sting and dry your skin, making it more likely to become irritable. In addition of being the perfect environment for bacteria to thrive, a constantly dirty shaver wouldn’t perform at its peak level, and definitely won’t last long. A quality electric shaver isn’t cheap- keep it clean and it will last longer. Embrace shaving electric wet shaving; have fun at it. Before the advent of electric wet dry shavers, for some (probably many) shaving wasn’t pleasurable, and it sure wasn’t fun. It wasn’t something most men look forward to. But now since the emergence of electric shavers – men can’t wait to whisk away at the slightest appearance of what is called facial hair.